Barbara C. Haeberle was born on 4 February 1864 in Niagara Falls, Niagara County, New York, at 10th Street. Georg Häberle and Charlotte Walz, appeared in the US federal census of 1 June 1870 in Suspension Bridge PO, Niagara Falls, New York. Other members of the household included Barbara C. Haeberle, Louisa Haeberle, Fredrika Christina Haeberle, Wilhelmina Haeberle, George C. Haeberle, Charles E. Haeberle and Charlotte Haeberle. Barbara C. Haeberle appeared in the US federal census of 1 June 1880 in Suspension Bridge, Niagara County, New York, living not far from her parents and her sister Fredericka Tattersall, and employed as a servant. Charlotte Walz appeared in the US federal census of 1 June 1900 in Niagara Falls, Niagara County, New York, at 942 South Avenue. Other members of the household included Barbara C. Haeberle, Caroline Catharina Christine Haeberle. She was employed as a bookkeeper by a planing mill, according to the 1900 census. Charlotte Walz appeared in the US federal census of 15 April 1910 in Niagara Falls, New York, at 942 South Avenue. Other members of the household included Barbara C. Haeberle, Dudley D. Padleford and Caroline Catharina Christine Haeberle. 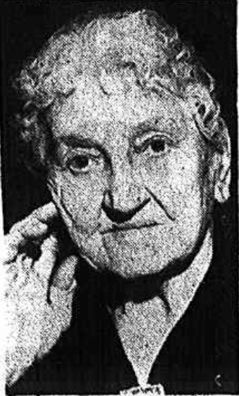 The following appeared on 9 August 1912 in the Niagara Falls Gazette: One of the oldest and most respected residents of Niagara Falls passed away yesterday afternoon in the death of Mrs. Charlotte Haeberle, mother of Water Commissioner George C. Haeberle. She was 83 years of age and had resided in Niagara Falls for sixty years. Mrs. Haeberle was the widow of the late George Haeberle. She was born in Abstedt, Germany, on December 7, 1829, and came to this country in 1853, arriving in Niagara Falls on April 1st of that year. This city has ever since been her home. She was a long-time member of Zion Lutheran Church. Surviving Mrs. Haeberle are two sons and five daughters. They are Mrs. Fredericka Tattersall, Mrs. Wilhelmina Swan, Miss Barbara C. Haeberle, Mrs. Charlotte Stein, Mrs. Carrie Paddleford, George C. Haeberle and Charles E. Haeberle, all residing in Niagara Falls. The funeral will be held on Sunday at 2:30 p. m. from her late home and at 3 o'clock from Zion Lutheran Church. Burial at Oakwood cemetery. The following appeared on 16 November 1922 in The Niagara Falls Gazette: Mrs. Charlotte Stine, 57 years old, No. 723 Division avenue, wife of Harry C. Stine, died at the family residence at 9:30 o'clock last evening after an illness of about five weeks. While Mrs. Stine had been critically ill for a number of days her death came as a great shock to a host of friends at the north end of the city. She was born in this city on April 23, 1865, and has resided here ever since. She was an active worker in the congregation of the Zion Lutheran church of Michigan avenue, where her loss will be keenly felt. Besides her husband she is survived by one son George, two brothers, George C. and Charles E. Haeberle, and three sisters, Barbara Haeberle, Mrs. Carrie Paddleford and Mrs. Minnie Swan, all of this city. The funeral services will be held from the family residence Saturday afternoon. The complete details of the funeral have not yet been arranged but will be announced later. Mrs. Wilhelmina Swan, 91, a native and resident of this city throughout her life, died last night at the Niagara Falls Memorial hospital. She was the daughter of the late George and Charlotte Haeberle, an old pioneer family in the city, and the wife of the late Gayton H. Swan. Mrs. Swan was the oldest member of the Zion Evangelical Lutheran church, a life member of Flagler Chapter 355, Order of Eastern Star, a charter member of Riverdale Rebeka Lodge 195, and a member of the Ladies' Aid society of the Lutheran church. Surviving are a son, Frank G. Swan, of Hamilton, Ont; three daughters, Mrs. Charlotte E. Dykstra, Mrs. Hilda B. Haugh and Mrs. Edna L. Hull; one brother, Charles E. Haeberle; two sisters, Miss Barbara Haeberle and Mrs. Carrie Padelford, all of this city, and six grandchildren and seven great grandchildren. Friends may call at the Dykstra Funeral home, 1619 Main street, until 1 p.m. Saturday. Funeral services will be at the convenience of the family. The Rev. Arthur H. Schmoyer will officiate. Funeral services were held today in Colorado Springs for Dr. George H. Stine, son of the founder of Stine drug stores here, who died in the Colorado city Wednesday. Dr. Stine, son of the late Mr. and Mrs. Harry Stine, was extremely active in professional, civic and home life in Colorado Springs, according to information received here. In own profession field -- he was an eye specialist -- he was known for the Stine-Crisp test for astigmatism used in the field today. For many years he had been engaged in research for means of improving the methods of surgical repair used in treating detachments of the inner or seeing surface of the eyeball. He published many papers concerned with this disorder, retinal detachment, and on phases of astigmatism and just before his death at 53 had completed a thesis on all phases of retinal detachment addressed to the American Ophthalmological society. He had been a yearly lecturer before the society. The last piece of research is said to have included tables, graphs and other data which would permit another surgeon to use quickly the result of many years of research. Dr. Stine also managed to do some research in a totally different science -- meteorology. He maintained a complete weather-reporting station in his home and until 1942 was the only Colorado Springs weather forecaster. He was considered an authority on the weather and climate peculiarities of the Rocky Mountain region and was called on to lecture to army and air force meteorologists. He is reported to have instigated revision of the sea level correction tables now used by the U. S. Weather bureau. He was a World War I veteran. Local survivors are two aunts, Mrs. Carrie Paddleford and Miss Barbara Haeberle, and an uncle, Charles Haeberle. The following appeared on 27 October 1952 in the Niagara Falls Gazette: Funeral services will be held at 2 p.m. Wednesday for Charles E. Haeberle, 84, president of the Haeberle Lumber Company, in his home at 1911 Tenth street. The Rev. Arthur Schmoyer, DD, will officiate. Mr. Haeberle, who died yesterday, is survived by two daughters, Mrs. Walter Tufts, Bronxville, Mrs. Harold White, Butler, Pa., and a son, Carl E. Haeberle, this city. Also surviving are two sisters, Miss Barbara Haeberle and Mrs. Carrie Padelford, both of this city, four grandchildren and three great-grandchildren. Masonic services will be held at 7:30 p.m. tomorrow by the Niagara River Lodge 785, F and AM, at the Tenth street address. Interment will take place Wednesday at the Mausoleum in Oakwood cemetery. Mr. Haeberle, who was the son of the late George and Charlotte Haeberle, was an honorary citizen of Boys' Town, Neb., and a life member of the Niagara Falls Exempt Firemen association. Niagara River Lodge 785; Niagara Commandery 60, Knight Templars; Royal Arch Mason Chapter 200; Ancient Accepted Scottish Rites; Niagara Falls Shrine club; Ismailia Temple of Buffalo; Niagara Falls Lodge 81, IOOF; Niagara Falls Lodge 346, BPOE, and the Oppenheim Zoological society. He was also a member of the Niagara club, the Hindoo Koosh Grotto of Hamilton, Ont., and the International Order of Hoo-Hoo, a lumberman's association. At the time of his death, Mr. Haeberle was a director of the Niagara Permanent Savings and Loan association and a former director of the Marine Midland Trust company. The following appeared on 5 February 1954 in The Niagara Falls Gazette: Miss Barbara Haeberle, 942 South Ave., celebrated her 90th birthday yesterday. She is the daughter of the late Mr. George C. Haeberle, founder of the Haeberle Lumber Co., and the late Mrs. Haeberle. Born on Feb. 4, 1864, also the birth date of the late Mr. Orin C. Dunlap, with whom joint birthday observances often were celebrated, Miss Haeberle lives with her sister, Mrs. Carrie Padelford. They had two brothers, the late Mr. George Haeberle and the late Mr. Charles Haeberle. At the time of her death Barbara C. Haeberle was living in Niagara Falls, New York, at 942 South Avenue. Barbara C. Haeberle died on 12 September 1956 at age 92 in Niagara Falls, Niagara County, New York, at Memorial Hospital. Miss Haeberle was the last surviving member of the original Haeberle family which migrated from Germany to this city to become influential pioneers in church, institutions and the lumber business. She was born in this city, the daughter of George and Charlotte Walz Haeberle. Her birthplace was in 10th street, a part of the property which bore the Haeberle name for 105 years. Her parents founded the Haeberle lumber mills 96 years ago and helped to found the Zion Lutheran Church when the congregation met in a tiny schoolhouse at Ontario Ave. and 11th St.
She was a sister of the late George C. and Charles E. Haeberle and the late Mrs. Caroline Haeberle Padlefors. An avenue, a shopping plaza and a room at Memorial Hospital were named in honor of the family. Miss Haeberle was active in the Zion Lutheran church until recent years and was a member of the Martha Society at the church. In years gone by, Miss Haeberle was a worker in many charitable organizations including the home for children in Lockport. Funeral services for Miss Haeberle will be conducted at the family home, 942 South Ave., at 2 p.m. on Saturday. The Rev. Arthur H. Schmoyer, D.D., pastor of the Zion Lutheran Church, will officiate assisted by the Rev. Vernon F. Squire. Private burial services will be held at the family mausoleum in Oakwood Cemetery. She was interred at Oakwood Cemetery Mausoleum, Niagara Falls, Niagara County, New York.